Can you guess which animal is Arsenal in this picture? It’s gang up on Arsenal season these days. The media have been doing it since the dawn of time, but now the rest of the universe is joining in. Even though we’re just three matches into our season, the barbarians are already at the gates, thanks in large part to our underwhelming summer transfer business. Let’s kick-off the Arsenal bashing with Platini’s band of morons. Leave it to UEFA to bring wounded gooners together. After investigating Arsene Wenger’s behavior during Tuesday’s match against Udinese, the brilliant minds behind Europe’s most prestigious club competition have determined that the Arsenal manager did violate the terms of his ban. As punishment, they have dished out an additional 2 match suspension which will prevent him from managing the team on Wednesday night. Arsenal intend to appeal the ban which could delay Wenger’s punishment and allow him to be on the touchline for the second leg of the tie. But it is now being reported that UEFA have failed to get Arsenal the necessary documents to appeal the decision in a timely fashion and Arsene could be forced to serve the suspension anyway. It’s all a bit too predictable from UEFA at this point. Let’s just hope Robin van Persie doesn’t get sent off for shooting again. But UEFA aren’t the only organization giving Arsenal problems at the moment. Manchester City seem to have won the battle of wills with Arsene Wenger. Despite his initial claims that he wouldn’t hesitate to use Samir Nasri on Wednesday, it now appears that the manager has had to change his position. It’s unclear whether the player himself refused to participate, or whether Arsenal simply yielded to Mancini’s demands, but it’s being reported that Nasri will not travel with the team to Udine ahead of the crunch fixture. We should know soon enough if that’s indeed the case. While that certainly suggests Nasri’s transfer will go through imminently, it also creates a selection problem for Wednesday night. Arsenal should be well equipped to score goals with Gervinho, van Persie and Walcott all likely to start. But the midfield is the real source of concern for the team right now. Nasri’s presence would’ve added much needed experience and prevented the manager from having to make some potentially unpalatable choices. With Aaron Ramsey in poor form and Tomas Rosicky playing only marginally better and carrying a slight knock, Wenger would probably have preferred to play only one of the two. But now he may have to use both players in midfield, especially if Alex Song is forced to deputize at center-back due to injuries. Either way, Nasri’s absence means there’s less depth in the side for a match where the team simply must get a result. Instead of playing Nasri with Ramsey, and having Rosicky as a substitute, now we’re likely to see Henri Lansbury on the bench. He and Ryo Miyachi were both recently added to the Champions League squad list for this fixture. Quality aside, that’s a big difference in experience. Arsene Wenger will give his pre-match press conference today and that should give us more insight into how the manager might set-up the team. A lot will obviously depend on the injury news and we’ll just have to hope that Johan Djourou is fit enough to start. I’m sure Wenger will also be forced to answer more questions about Nasri and possible new signings as well. Strong words from the Italian striker. But I have to wonder why Udinese lost and failed to score in the first leg if Arsenal are such a weak side. Does that mean Udinese are an even weaker side? I suppose we’ll find out tomorrow. Di Natale should remember that his team won’t be facing the lumbering, out-of-form Chamakh in the second leg. They’ll be forced to deal with the much more dynamic and clinical van Persie. It’ll also be incumbent upon the home side to take the game to Arsenal. Then we’ll see how well they cope with our counter-attack. Back in the Premier League, Manchester United fired a little warning shot of their own by destroying Sp*rs at Old Trafford yesterday. The upside is that it left Sp*rs bottom of the table. Even when we’re reportedly in “crisis,” Sp*rs still find themselves in our shadow. The downside is that United looked irresistible at times. Their new players look well integrated into the team and United didn’t seem to miss their injured starters at all. It’s amazing how a team can gel when you get your transfer business done early in the summer and spend the rest of the time focusing on preparation for the new season. Based on what I saw yesterday, if we arrive at Old Trafford on Sunday with a team that looks anything like the one we put on the pitch against Liverpool, the scoreline could be most unflattering indeed. Sometimes you get kicked in the gut by something that doesn’t happen. That’ll be the case when Juan Mata is finally announced as a Chelsea player. It’s definitely a case of the one that got away. I’m usually skeptical of media rumors surrounding our transfer business, but it certainly seems there was some fire to go with this smoke. Mata himself has said that Arsenal came with an offer but that the Blues offer was superior. I’m not suggesting Arsenal are to blame here. Chelsea’s involvement may have proved too much for us to overcome. But there’s no question that Mata’s skill-set fit our needs in midfield at the moment. He’s a player that most fans seemed genuinely excited about and his arrival would’ve helped ease some of the anxiety about the state of our squad. Seeing him play for one of our rivals will only pour salt in an already open wound. Whether you agree with Wright or not, there’s no question that these kinds of comments are counter productive. It makes the club look bad and shows a total lack of respect for the players currently playing for Arsenal. He’s piling on to serve his own agenda and I find it rather embarrassing for him. I realize he’s free to say whatever is on his mind, but in my opinion, he should be a little more discreet. If he wants Arsenal to recover from this wobble, I don’t see how it helps to have a club legend making such damning statements. Having said that, I really hope he’s wrong. Let’s cross our fingers for some good news on the injury front today, and worry about signing all our new superstars after we batter Udinese tomorrow. At this point, the universe owes us a favor or two. Have a good one gooners. This entry was posted in Uncategorized and tagged Arsenal, Champions League, football, Premier League, UEFA. Bookmark the permalink. For God’s sake, will someone please photoshop an Arsenal shirt on that poor creature?!! 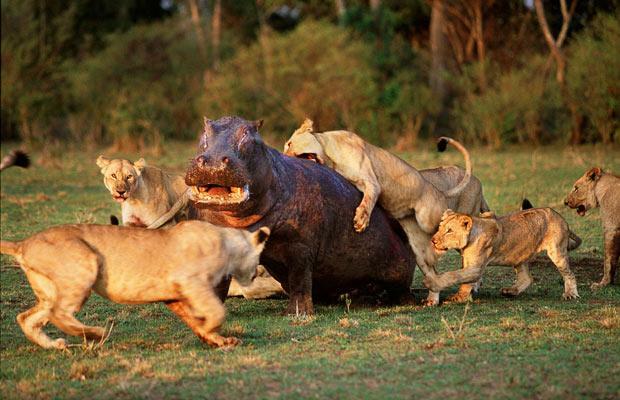 Might do one with Usmanov as the hippo and a few Arsenal bloggers that he tried to sue as faces on the lionesses. Try gagging them then, you repugnant beast! Without proper signings we WILL finsih mid table. Most def. I fear arsenal becoming Mid table club if not signing some experienced players. I don’t know what Arsene wants to prove. I am tired of hearing the excuse saying our players are young and inexperienced. Ian wright- great player, terrible fan. Juan mata is following the money to chelski, just like a certain promising lad a few years ago. Ian, pull out the log in your eyes- hypocrite!!! Yankee Gunner. Your comment about Chelsea’s involvement being too much for us to overcome is one I would like to look at. I have noted other Blogs talking about having to sell before we buy and not being able to compete with the big footballing financial powerhouses. If I am correct the board sold us the move to the emirates on the basis that when most of the debt was repaid it would leave us as one of the most financially powerful clubs in world football and would allow us to compete at the top end of the market. I am not sure of the entire facts but I believe our debt is largely reduced now and that we enjoy a turnover that is only surpassed by Utd in the EPL. That would have us ahead of Chelsea, City and Liverpool in this area of financing. Then comes the benefactors or backers. I believe again that out of all the top clubs only City have richer backers than the 2 guys who control 97% of the Arsenal shares. These 2 guys have a combined wealth double that of Abramovich’s and well ahead of the Utd and Liverpool backers. We are therefore ahead of Chelsea on both counts and should be able to compete with Utd and City by the fact we are ahead of both in one area. I believe we were also named as the 7th most valuable sports franchise in the world, and the 3rd out of all football clubs behind Utd and Madrid. How is it then that so many people assume we can’t compete with Chelsea. I feel the emphasis should be, not that we can’t compete, but that we are choosing not to compete for whatever reason. It would be interesting to get your take on this point Yankee Gunner as this is what is frustrating me the most as I feel this dragging out of things at the expense of compromising the start of our season is completely uneccesarry and avoidable. This to me suggests something is very wrong with the internal politics at Arsenal and I think the fans need to know if it is indeed down to AW’s famous stubborness or if the board are holding him back. If it is the latter then it is shameful that the board have basically hung Wenger out to dry and take all the flak, and it would further show that in not airing his dirty laundry in public what a great man he is. If the board have, however, given him carte blanche on all matters and stated money is no object then we need to know that as well. If this is the case then as much as I love AW and desperately want him to fulfill his legacy of taking us through the lean years and emerge to build a team to bring back the silverware, he would then have to be held accountable for any failings. AW made the statement about big clubs not selling their best players. For me what would have told the world we were a big club and financial powerhouse would have been to go out and buy up all the players we need then worry about selling. In trying to hold onto Cesc and Nasri we have ended up looking more desperate. We could have splashed out up to £100m to get quality players in first but then reclaimed some £75m on sales of Cesc, Nasri, bendtner and other fringe players. That would have been decisive and sent a message to the world that we will not be messed about by the likes of Nasri and that we have the means to replace you and leave you in limbo if your commitment to the club falters. What do you think Yankee gunner? Are we really struggling to compete financially or have we accepted this is the case for so long now that we all just go along with this as an excuse without actually taking a step back and looking at the big picture to see if this is actually the case. You make several good points, but just two quick thoughts in response. First, I think the problem with Cesc was unrelated to money or ambition. I genuinely think the call to return home was too great. With respect to Nasri and transfers generally, I don’t think the issues is money spent on transfer fees. I think Arsenal’s wage structure has fallen out of line with our rivals. Maybe we can’t compete with City’s wages, but we need to be closer or we will see more summers like this one. The money is there for transfers, but that money must also be allocated to wages. Why would Hazard come to Arsenal this season for a wage of 70 or 80k/week, when he could go to chelsea or city in a year and make double that? That’s the real problem in my opinion. Wenger and the board don’t see eye to eye. We are in a little trouble right now. Everyone wants to leave, we can’t attract big name players, we can afford high wages. We are fast becoming an also ran middle of the table wanna b team, whose fans pay highest match fees in the world. Not a lot of positives at the moment. Def need to win tomorrow, might help heal the wounds a little bit. “Any football fan just wants to be proud of their team, whether they win or they lose is really irrelevant because thats allt that matters”..a City fan said this!